The views of Vltava river are amazing. Are you a fan of Czech beer? Would you like to taste all of the different types and get tips on how to become a true beer connoisseur? Enjoy a unique beertasting experience.Want to try? Order your own beer tasting experience. Enjoy your beer in local Czech pubs and restaurants. Would you like to see Prague and its beauties from a different perspective? Go for a boat ride or a romatic cruise with your loved one.Want to try? Order your own Prague river cruise. Exploring Prague on foot isn´t your cup of tea? 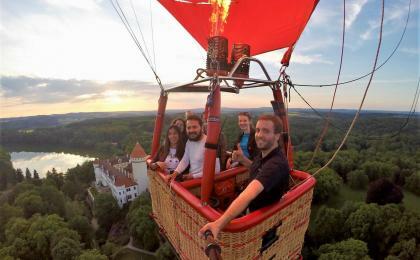 Check it out from above on a sightseeing flight that will show you not only Prague, but also Karštejn and other nearby castles.Want to try? Order your own sightseeing flight. Your feet already hurt when you hear about all the sights you must not miss while in Prague? Hop on a segway and make sightseeing more fun than ever.Want to try? Order your own segway experience. There are “must sees” in Prague that are without question - Old Town Square, Charles Bridge and the Prague Castle. A true jewel among Prague´s historical monuments it the Old Town orloj - a medieval astrological clock surrounded by legends of the mythical clockmaker Hanuš, who had to be blinded to keep the secret of the clock´s unique mechanism. Of course we have to start with the obligatory sightseeing. If you´re not really a history buff, you´ll be satisfied with the “Big 3” -the Old Town Square, Charles Bridge and the Prague Castle. Now you´ve seen the symbols of Prague and can move on to some less orthodox activities. Just a 5 minute walk from the Prague castle lies the quarter of Letná with its famous beer garden overlooking the city. Stop for a beer and enjoy this unique recreational area that locals love or move a bit further to the spot, where amonumental statue of Josif Stalin used to stand till the 1960´s. Now its a skater Mecca and a nice place to meditate beside a huge pendulum installed here after the Velvet Revolution. 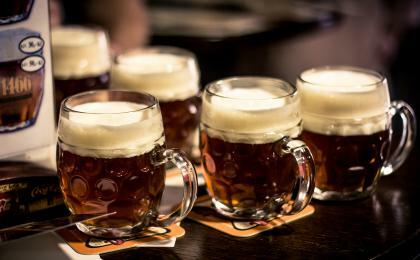 Now Prague´s beer culture is something to experience! The famous pubs like“U Hrocha”, “U Tygra”, “U Fleků” and others will give you a hint of how things were in the good old days - a grumpy publican serving you one beer after another without you even ordering or finishing the previous beer, clouds of smoke and of course - the tasty hoppy beverage at its best. And we´re not through with beer yet! You can experience it in a different way at the popular Prague beer spa. Bath in beer and serve yourself from your very own beer tap attached to the tub. Prague is an escape room metropolis - find your way out from historical cellars under Old Town or out of industrial buildings with various themes further from the city centre. Take the elevator to the top of Žižkov´s transmission tower - admire the panorama, have a meal at the futuristic restaurant located in one of the floors or book the only room in this technical wonder for a romantic, yet original stay. While checking out Žižkov, don´t miss the Vítkov National Monument with an exhibition mapping Czech history. Another great place where to admire Prague from above is the Petřín hill with its Eifell inspired observation tower and mirror maze. The lovely park underneath is a popular place for rendezvous. Take the cable car from Újezd so you won´t have to go all the way up. Jewish Prague are not only the richly decorated synagogues of Josefov and Old Town. Take a walk through the New Jewish Cemetary in the quarter of Strašnice and look for the grave of Franz Kafka. In fact the whole area of the Olšany cemeteries is pretty interesting. The area of Vyšehrad is a great place for a picnic or beer overlooking the Vltava river on one side and the quarter of Nusle on the other side. It is a sacred place for the Czechs associated with many legends - like the one about Šemík and Horymír. When the sun goes down, the real fun is about to start. Hipsters will love the so called “náplavka” along the Vltava river with pop-up bars and concerts, fans of electronic genres will be amazed by the Cross club in Holešovice. And that´s not nearly everything Prague has to offer. 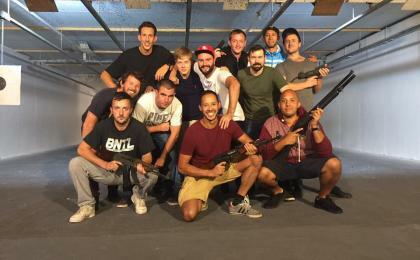 Team up with ActiveCzech.com and make the most of your stay in the heart of Europe!